A Dutch violinist, conductor and showman, Rieu has sold more than 40 million albums worldwide. Crowned the “King of Waltz” by the media, Rieu believes that everyone can enjoy classical music. Following in the footsteps of Johann Strauss himself, he encourages his audiences to get out of their seats and waltz in the aisles. Together with his 50-pieces Johann Strauss Orchestra, he tours on five continents. Every year, more than 700,00 fans attend an André Rieu concert, establishing him as one of the top ten touring acts in the world. In 2008 he’s was crowned nr. 1 Classic Artist in the US and scored he more than 100x Platinum in Australia. André Rieu lives in a castle in Maastricht where the real D’Artagnan was said to have had his last breakfast before he died in battle serving Louis XIV. It’s a castle that André Rieu as a child used to visit to take piano lessons, but he dreamed of living in the castle, renovating it, making it light, filled with golden chandeliers and beautiful paintings. Encouraged by his father, a symphony conductor, Rieu began violin lessons at the age of five. Rieu’s training eventually brought him to the Royal Conservatory of Brussels where he was awarded the Premier Prix. In 1987, he formed the Johann Strauss Orchestra. After the Netherlands had been conquered, the rest of the world followed. His albums are bought every­where from New Zealand to Japan and he has sold over 30 million copies worldwide. From his successful records came his even more successful concerts. André Rieu and the Johann Strauss Orchestra now perform in Australia, Japan, South Korea, Canada, the US, and across Europe. His live shows are an extravaganza of crinolined ladies whose every costume he gives personal approval, fairy tale castles and ice rinks. The most excessive and extravagant show to take on the road. 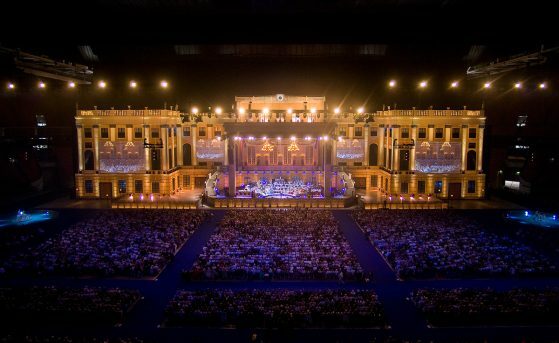 In 2007 Rieu even build a full-size reproduction of Vienna’s imperial Schönbrunn Palace as a stage set for his “World Stadium Tour: A Romantic Vienna Night”. The biggest stage set ever to go on tour. With 125 meters wide, 30 meters deep and 35 meters high it only fitted in the largest stadiums. The set included 2 ice-skating rinks, 2 fountains, and a ballroom dance floor situated above and behind the Orchestra. Rieu’s largest concert attendance to date was 38,605 in Melbourne’s Telstra Dome. 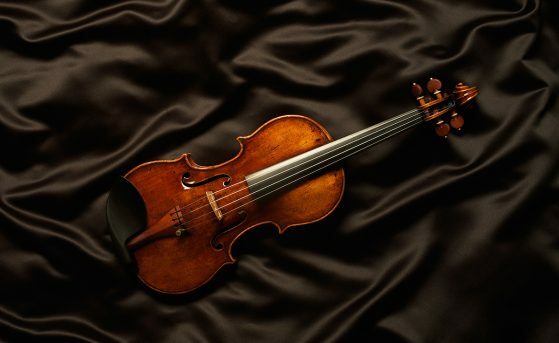 “If I would ever put down my violin I would be an architect. I am always building.” Although he’s referring to the renovations on his own private castle it is a metaphor to how he rebuilt the waltz. “I never say stand up and dance to an audience, they simply do. It’s because of the way you might play the Danube.” He sings to the tune of Blue Danube, a tired sleepy song, and then he sings it in a different time signature that brings a smile to the face and a tap to the toe.